Thurne is a riverside village in the Norfolk Broads, set in acres of marshland and agricultural land, bounded by the Rivers Thurne and Bure. For centuries a living was made from the land, the waterways and marshland. 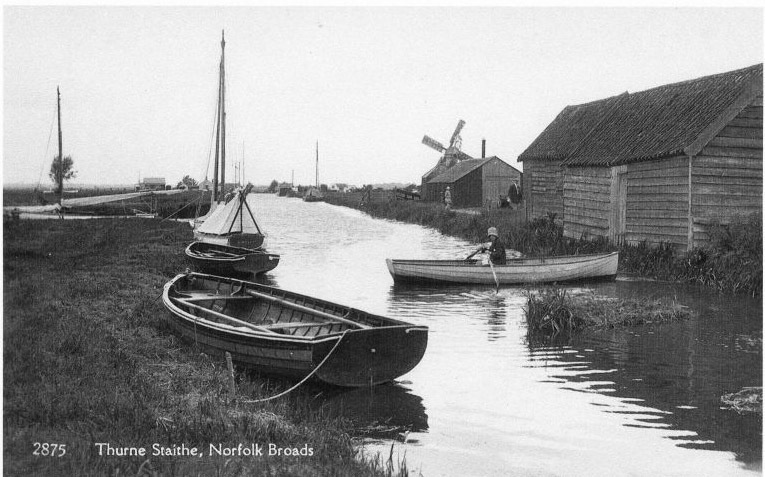 The three communities of Thurne, Ashby and Oby are linked historically and traces and records of their existence go back to Domesday. The odd Neolithic axe and Roman coin found in the area tell us there was human activity here long before that and that there is still yet more to be discovered. A small but active archive group was established in 2005 to gather, record and connect the past and present through documents, photographs and memories. We have published a short history, embroidered a textile hanging to illustrate some of the significant features and activities of the area and have started a mapping project. A wildflower project is under way with the aim of repopulating verges and other selected areas with the plants that used to grow here. Our website went on line in 2015 and is constantly being added to and kept up to date. This archive entry was last updated on 18 October 2017. Information incorrect or out-of-date?